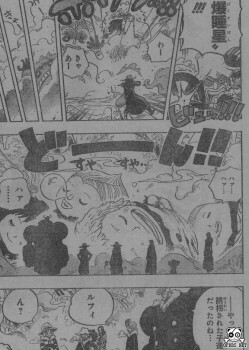 Onepiece 665 Spoilers Quotes:Onepiece 665 Trivia: Fishman Island is the home of the fishmen and merfolk It serves as an underwater gateway to the New World for those who do not wish to cross over the Red Line above. 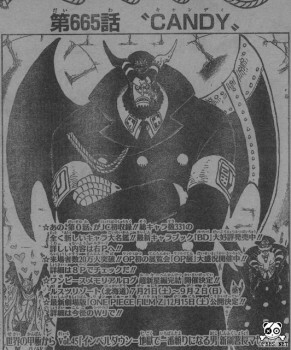 Though it is literally directly under the main seat of power of the World Government, it was previously under the protection of Whitebeard, and now Big Mam. 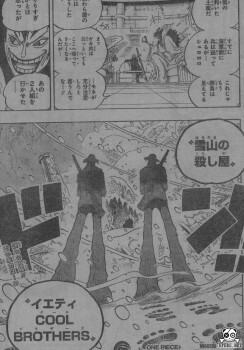 Zoro, Sanji, and Brook search for the Samurai, who disappeared at some point in search of his torso. All of a sudden, the particularly large kids are in a lot of pain. 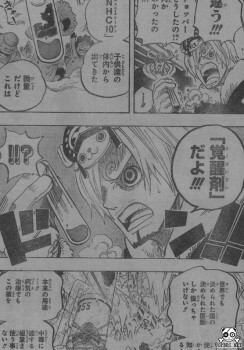 but Chopper flips out and objects, holding a test tube in his hand (with some sort of test results). He detects a very small amount of stimulant in the kids’ bodies. On top of this, the giant kids seem to go crazy and start rampaging, so with no other option, Usopp uses his Sleep Star to put them down. The giant kids were all normal size when initially brought to the island. It seems as though they were turned giant size while on the island. Chopper suspects Master’s experiments are to blame. 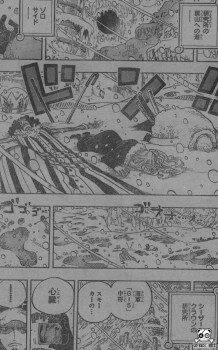 Zoro, Brook, and Nami (really, Sanji) are collapsed on the snow. There are some giant footprints nearby. Chapter ends with a shot of these two from behind. They seem to be twin giants, from the size of the footprints, and they’ve got guns strapped to their backs. 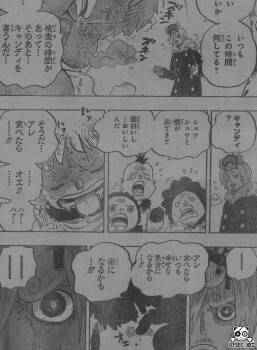 Onepiece 665 Spoilers at mangabox.wordpress.com will out on Tue or Wed. If you like discuss the onepiece ワンピース ネタバレ 665 please leave a comment bellow. Please be patient.